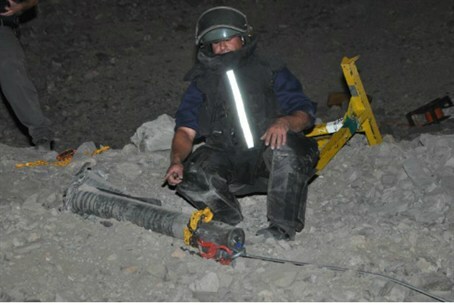 Security forces locate the remains of a Grad missile that was likely fired late last week. Israeli security forces located on Tuesday evening the remains of a Grad missile that was fired towards the city of Eilat last week. The rocket remains were located north of the city, and it is believed that the rocket was fired by Sinai-based terrorists towards the tourist city last Thursday night. Last Thursday evening, residents of Eilat reported hearing loud explosions in the city. Security forces checked to determine whether the explosions were caused by Grad missiles and, after several hours of searching, police and the Home Front Command assessed the situation and gave the all clear for life in the city to return to normal. On Friday, a Sinai-based jihadist group claimed that it had fired rockets towards Eilat. The group, Jamaat Ansar Bayt Al-Maqdis, claimed it fired two Grad missiles towards the city and claimed that the missiles had "frightened Allah's Jewish enemies" and made them run for shelter.